Entertainment with a purpose ! Thank you for visiting my website! Hope you will check out my schedule and find when I will be performing in your area! You will also find promotional material on my schedule page as well! I have music available for download on iTunes and Amazon. You can also check me out on Facebook! Thanks and I hope to see you soon! As of August 2018, I am excited to announce that I am the newest member of the legendary Kingsmen Quartet! 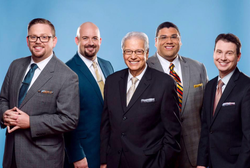 Most of you know that the Kingsmen have been one of gospel music's top singing groups for more than six decades now, as well as some of my heroes. For my name to be a small part of this incredible legacy is very humbling to me. I look forward to many great years ministering in song alongside my friends Ray Dean Reese, Brandon Reese, Chris Jenkins, and Chris Bryant. For those who have already asked or been wondering, I will still be making a handful of solo appearances here and there, as my schedule will allow. I will still be keeping this website online so that I can keep in touch with you, my friends! I will include all of the Kingsmen's upcoming dates on my schedule, and I also urge you to check us out at www.kingsmenquartet.com. Hope to see you soon! Visit the product page for more information on how to order Alan's music!